Thelma Commey has been announced as the next Methodist Youth President. She was elected at this year’s 3Generate event, the annual Methodist Children and Youth Assembly, held in Southport over the weekend 23-25 November. Thelma will serve from September 2019 to September 2020. Thelma, from Milton Keynes, is 18 years old and attends Queensway Methodist Church in Bletchley. She decided to stand for Youth President to help spread the Good News and encourage other young people to become involved in the life of the Church. 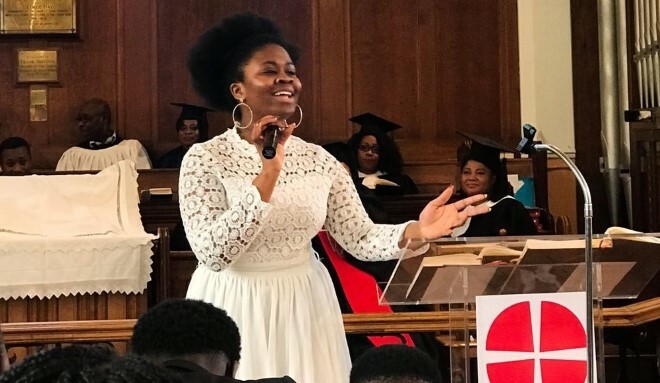 Thelma commented: “I decided to stand for Youth President because I am passionate about the work of God and would love to encourage young people to get involved. My campaign, entitled ‘Jesus Loves All’, focused on presenting Jesus Christ as a saviour, through the talents of young people. Thelma will commence her role after an induction service to be held in September 2019. This entry was posted in Latest News.. Bookmark the permalink.